Shared walls, air balancing, energy efficiency, stack effect, changes in local code…engineers face these challenges and more when designing centralized ventilation systems for multi-family dwellings. It’s no easy task to comply with codes and regulations, plus satisfy building owners and developers. American Aldes and our manufacturing representative partners have worked alongside engineers for nearly 35 years designing cost-effective solutions that are easy to integrate into designs, install, and maintain. 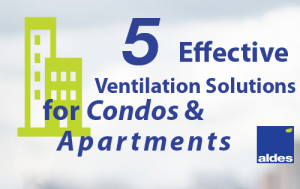 Here’s a look at five popular solutions from Aldes that’ll help you design ventilation systems for apartments and condominiums without the headache. The most configurable line of split-system Heat and Energy Recovery Ventilators with sizes up to 10,000 CFM. Each unit is built to your specifications, with multiple core options, duct configurations, supplemental heating and cooling, economizer controls, and they’re AHRI Certified. HRVs and ERVs exhaust stale air and humidity from buildings and bring in fresh air while maximizing energy efficiency and reducing the load on heating and cooling systems. Constant Airflow Regulators (CAR-II) correct stack effect by automatically adjusting to the changes in static pressure, so energy is not wasted and optimum air quality is maintained. CARs don’t require any electric or pneumatic sensors or controls and are a low-cost solution for balancing ventilation systems, eliminating the need for on-site balancing and repeat maintenance, keeping the system running at optimal performance year-round. These are perfect for new construction or retrofit projects. Zone Register Terminals (ZRT) provide energy saving demand control, self-balancing ventilation without the need for individual fans in bathrooms or other high humidity areas. They provide up to four different control schemes without the need for pneumatic, electronic or DDC control systems. Parallel Damper In-Line Zone Register Terminals (ZRT-PDIL) also replace individual fans or VAV terminals, and provide combination low-flow indoor air quality ventilation and on-demand high flow spot ventilation using the same central exhaust or supply fan system. The ZRT-PDIL is your simple solution to provide makeup air for equipment like kitchen range hoods, or demand based ventilation for high volume applications. Constant Exhaust Registers and Constant Supply Registers (CERs and CSRs) combine the constant airflow regulators (explained in #2 above) with an exhaust or supply grille constructed of heavy-gauge extruded aluminum. Airflow rates are factory set based on what is specified, and are quickly installed like any grille, so no additional labor is required. Need one of these with a fire damper? We’ve got it. Constant Exhaust or Supply Registers with Fire Dampers (CER-FEA or CSR-FEA) regulate airflow and include a grille and a two-hour rated fire damper. Constant Exhaust Grille (CEG-II) automatically regulates airflow and can be adjusted to distinct pre-calibrated airflow settings, making it easy for the contractor to make on-site adjustments if ventilation demand changes. If you’re thinking that looks interesting, but how do I know it works well? Don’t just take our word for it. Visit our project map to see a small sampling (and by that we mean hundreds!) of multi-family buildings across the nation that have recently installed these products and others. Aldes has a full lineup of products for centralized systems, but if it’s unitized/compartmentalized you’re designing, we have cost effective, energy efficient systems for that too. In fact, we’ve got compact sized heat and energy recovery ventilators perfect for apartments or condos, and ENERGY STAR rated fan small enough to fit into tight spaces. Have look at these options at www.aldes.us/multifamily.